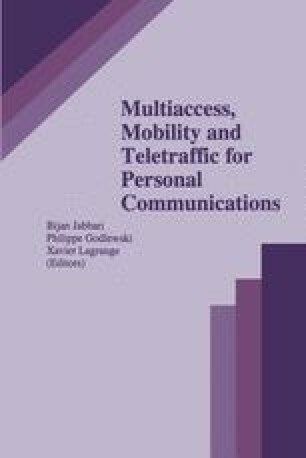 A simple call admission control system for multiservice wireless networks is presented. By means of it, connection requests coming from different “classes” of traffic (i.e., voice, data) are regulated in order to meet a set of Quality of Service (QoS) constraints. The admission mechanisn works on two levels: a static and a dynamic one. The static level looks at “packet-level” QoS, such as cell loss and delay, while the dynamic level takes care of call dynamics and allows to drive the load of the system with respect to the various traffic classes. Whenever a connection recpiest for the n-th traffic class appears, both levels of control intervene and the call is accepted if both of them do not reject it. The decision at the static level is deterministic, and it is based on the concept of Schedulable Region; the decision at the dynamic level is probabilistic and it is based on the concept of Input Rate Region, which is explained in the paper. Results that show the performance of this control mechanism are presented.